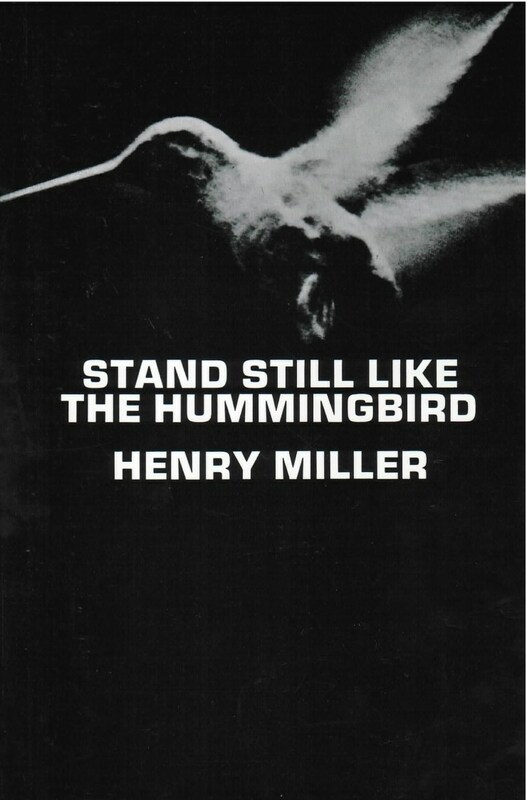 One of Henry Miller’s most luminous statements of his personal philosophy of life, Stand Still Like the Hummingbird, provides a symbolic title for this collection of stories and essays. Many of them have appeared only in foreign magazines while others were printed in small limited editions which have gone out of print. Miller’s genius for comedy is at its best in “Money and How It Gets That Way”––a tongue-in-cheek parody of “economics” provoked by a postcard from Ezra Pound which asked if he had “ever thought about money.” His deep concern for the role of the artist in society appears in “An Open Letter to All and Sundry,” and in “The Angel Is My Watermark” he writes of his own passionate love affair with painting. “The Immorality of Morality” is an eloquent discussion of censorship. Some of the stories, such as “First Love,” are autobiographical, and there are portraits of friends, such as “Patchen: Man of Anger and Light,” and essays on such other writers as Walt Whitman, Thoreau, Sherwood Anderson and lonesco. Taken together, these highly readable pieces reflect the incredible vitality and variety of interests of the writer who extended the frontiers of modern literature with Tropic of Cancer and other great books.